An uninvolved bystander has no authority to contest a will. In order to challenge a will’s validity, a party must have standing. In other words, an individual must prove she would be damaged by acceptance of a forged or invalid will into probate. Further, this interested party must demonstrate just cause for her belief that the will is not genuine and for requesting a court deny its admission to probate. All fifty states have statutory requirements regarding the acceptance of a will into probate by the court. The main requirement is a will must reflect the true wishes of the testator, or maker of the will. States such as Vermont and Alabama require that a will is witnessed by at least two individuals, while California and Texas accept holographic wills written entirely in a testator’s handwriting without the presence of witnesses, so long as the will complies with other provisions of the states’ probate statutes. Without attesting witnesses to verify the testator’s signing, however, verification of handwriting may be the only evidence a holographic will truly reflects the wishes of the deceased. The signature on a will that is being challenged as a forgery may be closely scrutinized by a handwriting expert who may compare the will’s signature against the decedent’s signature on other documents. The challenging party may question a will signed with an “X,” or in frail handwriting, claiming the testator lacked mental capacity to execute a valid will. Physicians and witnesses may be called to testify as to the testator’s state of mind and physical condition at the time of the signing. Often when a will is being signed, the testator is often required to initial and date each page of the will in the margin. This action is performed to discourage will tampering by an unscrupulous individual who might attempt to alter an original will by substituting pages to change the disposition of property. A self-proving will contains signed testimony of witnesses, either as a part of the will or as a separate affidavit, in which they affirm before a notary public that they witnessed the signature and, to the best of their knowledge and belief, the testator was of sound mind and verified the document before them was his will. If a separate self-proving affidavit was signed, it should be presented to the court along with the will. Although a self-proving will generally eliminates the need for witnesses to appear before a probate court, a will contest action may require their presence. If a will does not contain self-proving language, probate courts generally require a hearing to prove it is genuine, at which the witnesses appear and testify. If witnesses cannot be located or are also deceased, a handwriting expert or other individual familiar with a witness’s handwriting may verify the signature. Most states, however, recognize self-proving wills that eliminate the need for a witness to attend a probate hearing. Handwriting University International, Handwriting Analysis Training Site: Handwriting Expert Testimony Key to Los Angeles Probate Settlement. Forgery Trend Fuels need for more Court Qualified Forensic Document Examiners. Justia US Law: 2006 Alabama Code - Section 43-8-167 — Mode of proving will generally. Justia US Law: 2006 Alabama Code - Section 43-8-132 — Self-proved will - Form and execution; how attested will made self-proved; effect. A person who creates a will is known as the testator. The process of administering the testator’s wishes in Louisiana is called probate or succession. Because the court generally assumes a will accurately reflects the testator’s wishes, it is difficult to contest it, but in limited circumstances, you may successfully accomplish this in Louisiana. 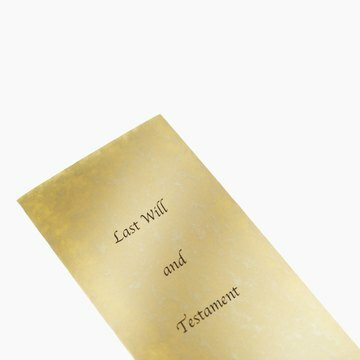 Many states recognize a last will and testament as valid even if it is handwritten with no witnesses to the maker’s or testator’s signature. Alabama, however, is not one of those states: Alabama requires that a will prepared in the state be witnessed by two people who are over the age of majority and of sound mind before being accepted by the court for probate.